This hefty chunk of parkland, north of North Melbourne, west of Carlton, has an identity crisis. It’s been set aside for public use since the 1840s. But the public has never known what to do with it. The great parks and gardens of London, Paris and New York have a clear place in their city’s psyche; everyone knows them, and if they don’t go there, at least they know what they are for. Not so Royal Park. It’s the poor cousin of the Botanical Gardens, a place we think we value (if we think of it at all) but we are unsure why. Over the years it’s been a place for grazing, a wilderness, a car park, a military base, a zoo, emergency housing, the site of sports complexes and hospitals. It’s housed murderers, it’s been called a ‘slum’ and a ‘plague spot’, it’s been the scene of angry protests.These days it attracts thousands of netballers and hockey players, and visitors to the zoo – who in most cases come and go without noticing the surrounding park at all. It’s one of the strangest, most unsettling spots in Melbourne. Maybe its history has something to do with that. Sure, it can be a nice place for an afternoon stroll. Parts of the park have been set aside for native grasslands and signs point you towards ‘remnant vegetation’. No doubt people who can identify trees, grasses and attendant wildlife would know what they are. Unfortunately, that’s not me. I recognise the call of bellbirds, up around the netball centre – that’s the limit of my knowledge. Last year, Royal Park was in the news when the developers of the East-West link proposed to dig a thumping great trench through it. There were angry protests, and when the Napthine government lost the election, that plan was abandoned. But it was only the latest of many controversial proposals inflicted on a contested space. 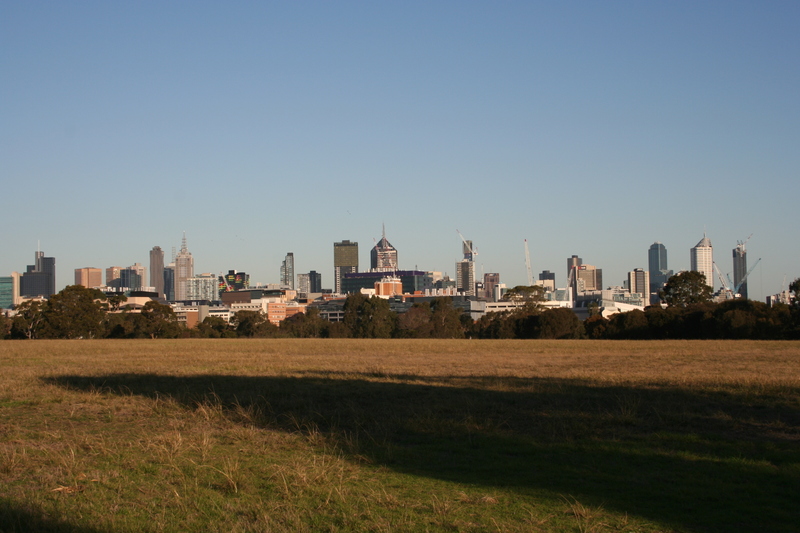 When you enter the park from the Flemington Road side and walk past the Royal Children’s Hospital, you come to an elevated area with a path around a very large circle of grassland. A few people are jogging, walking dogs, riding bikes. There are even skater dudes practising flip tricks over stray branches. There’s a sense of peace and openness, and a panoramic view of the city. And yet … it’s somehow not welcoming, that large circle; it doesn’t invite you to walk and relax and explore it. We stick to the path, most of us. I wonder why there aren’t more people here. It was Governor LaTrobe, back in the 1840s, who wanted the park reserved for recreation. It was held back from sale when the rest of the city was sold off in one of Melbourne’s periodic real estate frenzies. Royal Park was formally reserved in 1876. But the Trustees didn’t know what to do with it. It wasn’t a botanical garden, but neither did they want “a place of recreation for multitudes”. It was proposed to be a place for “our most umbrageous [i.e. shady] eucalypts and acacias”. However, despite good intentions, plantings over the years have failed. These wide open spaces are far from umbrageous. There is a distinct lack of umbrage. Meanwhile, bits were carved off by sports clubs, graziers, and the zoo (founded by Albert le Souef in the 1870s). By 1923 the park was a wilderness. What’s that big stone thing? On the far side of the big grass circle, you come to an unexpected object, like a slim bluestone Dalek. 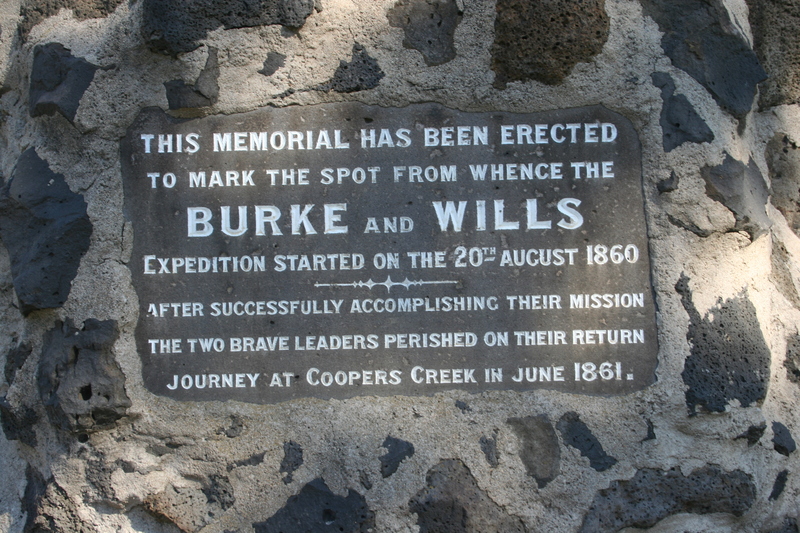 This was erected in 1890 to commemorate the doomed expedition of Burke and Wills, which departed from this spot in 1860. It’s an odd memorial, about as sophisticated as a kindergarten art project in concept and execution. The plaque boldly claims that the expedition was ‘successful’ which seems a big call given that most of them died due to bad leadership, ignorance of the land, and refusal to accept the help of Indigenous people (Burke fired on the Aborigines when they offered assistance). Is it ironic, or just appropriate, that one of Melbourne’s wilder locations (in part, anyway) contains a memorial to people who spectacularly failed to understand the Australian landscape? Their attitude to Indigenous people was hardly unusual though. In 1888, as historian Tony Birch has written, an Aboriginal family was put on display in Melbourne Zoo by Albert Le Souef for something called “an exact representation of an Aboriginal people’s encampment in the Bushland exhibit”. During World War Two, thousands of American soldiers were based at Royal Park at a military camp known as Camp Pell. (You can see the locations of the huts on these marvellous aerial photographs of Melbourne in 1945). Tents and Nissen huts were erected, and the park traversed by roads with names like Bronx and Frisco. What an odd thing to think of: thousands of young men from Michigan and Texas and New York and Tennessee and Idaho, dropped in this alien land among the redgums, waiting for orders that might send them to their deaths. Relationships between American and Australian troops were often tense, for reasons including the Americans’ better pay and apparent success with local women. In 1943 a mass brawl took place in central Melbourne involving 3,500 troops. The local media avoided reporting the incident. The most shocking event, though, involved a serviceman from New Jersey, Private Eddie Leonski. Leonski was a serial killer who murdered three women in two weeks in 1942. He was known by two names: the so-called ‘Brownout Strangler’ (because he struck when the Melbourne street lights were dimmed and windows covered in case of air raids) and, even more sinisterly, the ‘Singing Strangler’ because he was obsessed by women with beautiful singing voices and reportedly said ‘I killed them to get at their voices’. Leonski was hanged at Pentridge on the orders of General Macarthur. One of the other stories that lingers is the rumour of tunnels under Royal Park, containing tanks, weapons and other stuff left behind by the Americans. Some tunnels certainly exist, but no one seems to know how many, or what is inside them. These subterranean possibilities add to the strangeness. The indisputable remaining evidence of the camp includes two sentry boxes on Brens Drive. After the war, Camp Pell huts were used as emergency housing for thousands during Melbourne’s homelessness crisis (this was the era when the Housing Commission was building new estates in places like Flemington, which I walked through earlier). But many families ended up staying in Camp Pell for years. Camp Pell, nicknamed ‘Camp Hell’, was essentially a shanty town for thousands of people with nowhere else to go; toilet and cooking facilities were shared, the Nissen huts overheated appallingly in the sun, there was a quagmire when it rained and diseases inevitably broke out. The families living there, awaiting better housing, made the best they could of the situation. However, they did not receive much support or sympathy from the broader Melbourne community. The well-heeled locals raised a stink and the media portrayed the camp as a place of filthy moral degeneracy, crime and disease – the worst slum in Melbourne, in fact. Political pressure was applied to get rid of the camp before the Olympics in 1956. The Argus 24 April 1953 (source: Trove). The story of ‘Camp Hell’ has been well told by Adam Shand. And here are some recollections of Camp Pell from people who lived there, many of whom have fond memories of the place and didn’t regard it as hellish at all, despite the slurs that were levelled at them. The subsequent history of Royal Park is more positive: the creation of sports complexes during the 1960s and 1970s; the construction of the Royal Children’s Hospital in one corner. My own memories include rushing my kids to hospital for emergency treatment a few times (an unpleasant experience transformed into something positive by the wonderful medical staff). We’ve been to the netball centre, to play and to watch. My partner insists that we once saw comedian Rod Quantock construct a papier mache elephant outside the zoo, as part of a protest about, possibly, increased traffic disturbing the animals. But one thing that Royal Park doesn’t suggest to me is, well, a park. It carries the traces of its contested and muddled history, and embodies our confused attitude to landscape. There are places where beautiful gums have been preserved; there are vast empty spaces where Nissen huts once stood. Does Royal Park remember these struggles, these conflicts? Do the failures, follies and brutality of the past linger in the uneasy open spaces? Does it hold memories of foreign troops in secret underground labyrinths? Does the shadow of Private Leonski flit across the grassy circle at dusk, heading out in search of a woman with a beautiful voice? I drew some historical information about Royal Park from a Cultural Heritage Study prepared by Georgina Whitehead in 1998 for the City of Melbourne. Writer Tony Birch and artist Tom Nicholson created a work, ‘Camp Pell lecture’ in 2010, based on the history of Royal Park, including the exhibition of Indigenous people in Melbourne Zoo, the Burke and Wills expedition and Camp Pell’s use as emergency housing. Another fascinating piece and you’re right. It’s a strangely under utilised unwelcoming piece of parkland. I’ve never once picnicked there and mainly think of it for the many years of being a plodding netballer. Royal Park was also home to psychiatric institutions and I wonder if that contributes to the unsettling atmosphere. The former Kew Cottages and Willsmere sites would be fascinating places for visits for you as well – natural beauty mixed with disturbing melancholy. Good call on the psychiatric institutions, the tragic stories connected with those places would surely leave traces of some kind. Thanks for the suggestions re Kew and Willsmere. As a young boy I recall Camp Pell being a United States Army Camp, barbed wire entanglement surrounded the entire area, inside the barbed wire a trench, how deep the trench, I fail to recall, but none the less there was a trench, and that very trench was a determining factor in Edward Joseph Leonski being convicted by a United States Army Courts Martial, for the murder of three women in the streets of Melbourne. Some red clay was found on the remains of one of the victims clothing, this clay was ultimately linked to the soil of the trench that surrounded Camp Pell. Edward Joseph Leonski went to his death at the end of the hangman’s rope at Pentridge Goal¸ his war was a short one. There were supposed to be tunnels beneath the area, but as far as I know no one has, as yet, dug into them, I think it would be most interesting if the area was explored, ordinance and vast amounts of equipment were left behind by the Americans, it was rumoured. Post war Camp Pell was still a foreboding place, people moved into the Nissen huts left by the Americans and called them home, most had no choice; they’d been dispossessed of, in some cases, squalid living conditions and considered Camp Pell to be desirable. Between 1945 and 1951 I delivered newspapers to the residents of Camp Pell who could afford them, and to those who could not, and it was the responsibility of the “paper boy” to collect the payment for such papers, which I have to say, was sometimes quite difficult. The majority of the residents of Camp Pell were eventually rehoused in the suburb of West Heidelberg, and some would say how lucky they were. 1960-1970 I played cricket and football on the fields of Royal Park, and I’ve not been back to Royal Park for more than twenty years, perhaps I should return? The mysterious ambiance of the area may be no longer there, but I’m game to bet the ghosts of the past still linger in the shadows of the majestic Gum trees. Many thanks for the kind comment and for sharing your memories, Edwin. An indigenous man once told me Royal Park was (and remains, in spirit, if not in common practice) an important meeting place for Wurundjeri people. He explained further but I’m ashamed to say I forget the details. But I just wanted to point out that the place’s identity in this regard is indeed known; the “identity crisis” you mention is a non-indigenous identity crisis, and reflects a lot more than “our” relationship to Royal Park, but just to the invaded land in general (officially *occupied* land, until there’s a treaty). 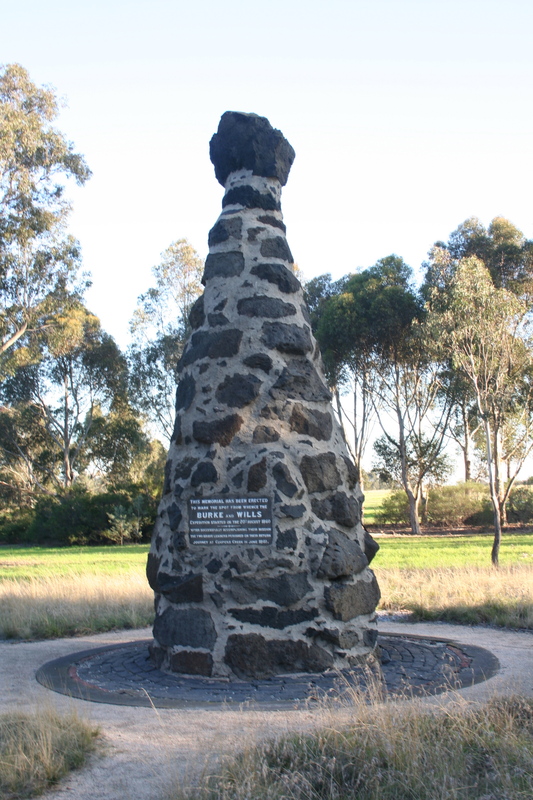 Also, the memorial to Burke and Wills is designed as a cairn – an old-school trail marker. So that explains the “unsophisticated” style and the idea of it. But yeah – dumb heroes, strange myth. Actually, it’s a bit like putting a lifeboat on a plinth as a memorial to the Titanic casualties. P.S. Cool little ghost sign in Little Oxford Street, Collingwood (near Stanley Street) – “For Itch”. Just looks cool – not much (remaining) substance. Thanks jh, excellent points all. An interesting perspective on a place I’ve spent a hell of a lot of time in, but only ever for sport or the Zoo. That probably suggests that you’re right about Melbourne not being quite sure what to make of the place. One part you missed that’s (perhaps thankfully) often overlooked is the section north of the railway line, which includes the golf course and one of the prettiest places to play cricket in any city. It’s the Ryder Oval (named after former Test cricketer, Jack Ryder), and I was lucky enough to have that as my home ground for 20 years or so. 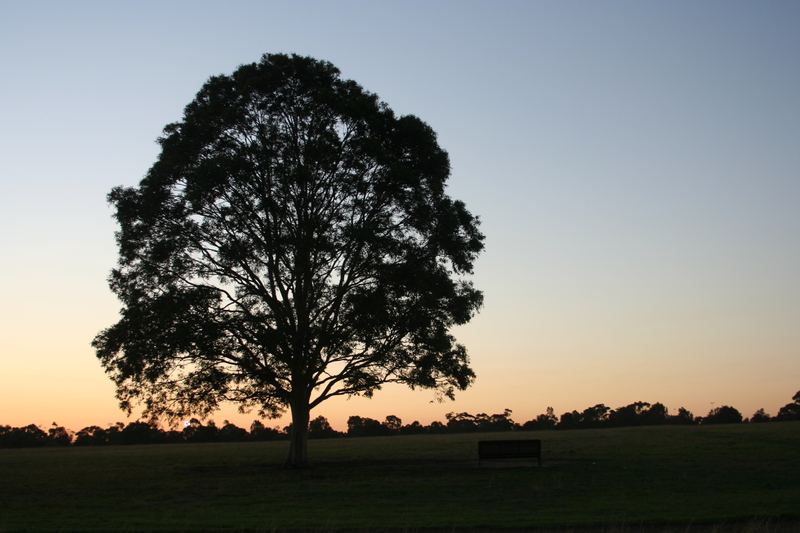 It’s surrounded by big old gum trees, sits high on the hill that rises up from Flemington Rd, has a great view of the city and is close enough to the Zoo to let you hear the lions roaring the the music being played after dark. Perhaps my favourite feature of it, though, is that anytime there’s a cool change or thunderstorm coming in after a hot Melbourne northerly, you can watch it approaching from the southwest & coming up the hill before the chilly wind hits you. I look forward to reading (about) more of your ramblings. Hi Rob, Ryder Oval does indeed sound a beautiful place to play (and watch) cricket. I will have to go and see a game there some time. No doubt the local swing bowlers are alive to the changing atmospheric conditions and can make the ball talk as the cool change comes in, bewildering visiting batsmen … Thanks for commenting. Thanks for this info on Royal Park. I have been exploring it a lot lately, and have always found it a little strange, but I enjoy that strangeness. It’s also weird how it’s right next door to the CBD but feels miles away. Once I watched the sunrise from the middle of that circle. It would be a great place to do that. Perhaps another factor making Royal Park seem strange to some is that it is not at all like the traditional idea of city parks on the model of Victorian parks in Britain. Governor LaTrobe set it aside for the health and recreation of the people of growing population of Melbourne in the 1840s. He had witnessed the dense growth and overcrowded conditions of London during the Industrial Revolution and the setting aside of Hyde Park as a healthier place for people to enjoy. Royal Park uniquely for an inner-city park has many of the characteristics of the landscape before the arrival of Europeans. However, it has been and still is constantly threatened by governments, bureaucrats, the road lobby and institutions like the zoo, the State Hockey & Netball Centre, the Royal Children’s Hospital that see it as something like terra nullius. A lot of local people do spend time regularly in Royal Park. One beautiful feature of the park is the Australian Native Garden in Gatehouse St. It was originally set up to show native Australian flora and fauna to visitors on their way between the airport and the city. I see people picnicking there. Nearby is a grass circle on a rise It seems to be perceived by many as some kind of empty waste land. In fact, it was a corroboree site and has been replanted with native grasses. The Meakers were placed imported in one of the spartan prefabricated iron cottages imported by LaTrobe to house government employees. Meakers lived there until 1934. They raised lion cubs and birds on behalf of the zoo. Francis Meaker was also appointed park ranger in 1870 and later crown lands bailiff for Royal Park. He looked after the park until he retired in 1905 when his eldest son Charles Meaker replaced him and fulfilled the responsibility with few resources until 1934. Francis Meaker was widely known for providing hospitality there for Aboriginal people camping in the park. The riot between the US and Australian troops was reported by local press. On page 3 of the Argus to be precise. Page one was, naturally preoccupied with the war.